Dougie Fife has signed a new deal with Edinburgh that ties him to the club until the summer of 2015. Fife, who can play on the wing or at centre, has scored four tries in 15 appearances so far this season. 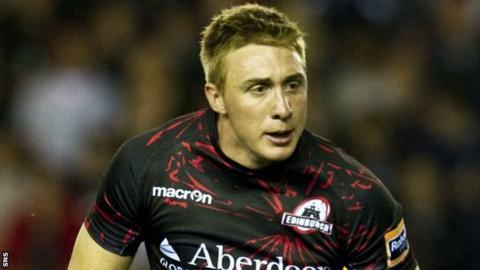 The 22-year-old has been capped for Scotland A and was part of the Scotland Sevens team in 2010-11. "To get this chance as a fully contracted player is a dream come true and gives me the confidence to push on," he told Edinburgh's website. "As a local boy I used to come to the games as a fan and was even ball boy at a couple of games. "At the start of the season I didn't imagine I'd be involved as much as I have been, but I've managed to get my foot in the door and keep it there with a few good performances. "I've been involved in some massive games, the derby against Glasgow Warriors and in the Heineken Cup, with each game seeming like it's the biggest game of my career. I've loved every minute of it. "It was my goal at the start of the season to get a number of games and secure this contract extension, so I need to set some new targets, keep working hard and push for more chances to start for Edinburgh Rugby." Head coach Michael Bradley added: "As well as being a top young player, Dougie's a keen learner and a fantastic example of how, with the right attitude and commitment, young players from the local area will be given the opportunity to be nurtured and excel at this club."